Prior to the Reformation the Catholics of Baddesley Clinton worshipped in the medieval parish church of St Michael, close to Baddesley Clinton House, which had been owned since 1517 by the Ferrers Family. The Ferrers remained loyal to the Catholic Faith and Mass was offered in their domestic chapel. The quiet but dogged resistance of the Ferrers and other local magnates helps to explain the survival of Catholicism in this part of the Forest of Arden. Henry Ferrers (1549-1633) was imprisoned, probably by force of fines under the recusancy laws, in 1599, and it is known that for a time ‘Sir William, the priest at Badsley’ was resident in the house. During the late 1580s and early 1590s Henry leased the house to two daughters of Lord Vaux who were devout Catholics. During their time the house became a secret meeting place for Jesuit priests and hiding holes were constructed, probably by St Nicholas Owen, to conceal them from discovery. On 19th October 1591, at the end of a conference of Jesuits from all parts of England, the house was raided by pursuivants. Five Jesuit priests and two secular priests (four other Jesuits having left the night before) were hidden for four hours ankle-deep in water in a hide that was a converted sewer. In 1603 the itinerant priest John Sugar was captured nearby, together with Robert Grissold, possibly after having celebrated Mass in the house, and in October 1611 it was related that ‘in Warwickshire and in the parts adjoining the pursuivants this last summer by searching have much troubled the Catholics.’ Despite all this, Catholicism continued to survive in Baddesley Clinton and the surrounding area, although the secret nature of the mission of the priests who, under assumed names and in disguise, ministered to the faithful at the risk of their lives means that few details have come down to us. In the middle of the seventeenth century Baddesley Clinton House became the headquarters of the Franciscan Fathers of the Second English Province. Fr Leo Randolph, a kinsman of the Ferrers, used the house as a base for his ministry throughout Warwickshire and Staffordshire. For a time Fr William Levison also lived there; he was able to minister to the needs of St John Wall under sentence of death in Worcester Gaol at the time of the bogus Titus Oates Plat (1679-80). St John Wall had himself ministered in Warwickshire in the late 1650s and must have visited Baddesley. With the accession of the Catholic James II, hopes were raised of some relief for his Catholic subjects. Fr Leo established a mission in Rowington, two miles from Baddesley, in 1686, and in the same year built a chapel in Warwick. A year later he built another chapel and friary in Birmingham for which George Ferrers provided timber from the Baddesley estate. Both chapels were destroyed by the mob in 1688 when James was deposed. The Franciscans, however, continued to minister to the district around Baddesley, and in 1756 Father George Bishop, O.S.F., took up residence in the house. After a disagreement with Thomas Ferrers he moved out of the house to Baddesley Green. This was a providential move since after the death of Thomas Ferrers in 1760 the house remained unoccupied for fifty years. Fr Bishop built a small chapel and established what can be described as the first permanent mission in Baddesley Clinton that was independent of the Ferrers family. In 1785 a Franciscan school or academy moved to Baddesley Green from Edgbaston on the outskirts of Birmingham and new buildings were erected for it in 1793 on the present site. Adjoining the academy a small chapel was built and registered for Divine Service in 1800; a cemetery was added in 1845. 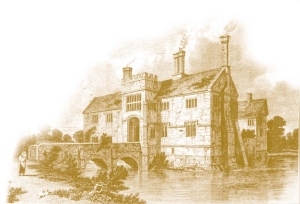 Fr Bishop had retired in 1790, often returning to Baddesley before his death in 1811. He was regarded as the founder, not only of the mission, but also of the church, and he was buried beneath the sanctuary of the chapel. A plaque on the wall of what is now the altar servers’ sacristy records the spot. The Franciscans had to close their academy in 1829 and the Mission was taken over by the Vicar Apostolic of the Midland District, who appointed William Benson as Missioner. Secular priests have served the Mission (later Parish) from that date until the present day. In 1850 the Poor Clares arrived from Bruges in Belgium to establish the first Convent of Poor Clares of the Colettine Reform in England since the Reformation. The 1860s found the small chapel falling into decay. The few parishioners were so poor that little could be done. However, in 1857 Agnes Mary Clifford, daughter of the Hon. 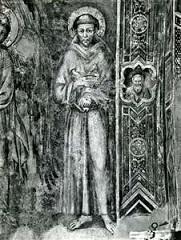 Charles Clifford (brother of Hugh Charles, 7th baron Clifford of Chudleigh, co. Devon), had been professed in the Poor Clare Community and brought a considerable dowry. Thanks to this, and the generosity of her parents (who are buried before the sanctuary of the present church), and also the large dowry of Sr Mary Clare Dymock, new conventual buildings were erected, together with a new church, presbytery (1882) and school (closed in 1990 and converted to domestic use in 2015). The old chapel, standing on the site of the present Sisters’ choir, was demolished, and a church, designed by Benjamin Bucknall of Swansea, was built by J. Hall of Warwick. It was dedicated to St Francis of Assisi and opened on his feast day, 4th October, 1870. It was consecrated on 5th September 1894. The connection with the Ferrers family remained strong throughout these years. Marmion Edward Ferrers (1813-1884) gave or leased the land on which the convent was built, and his wife, Rebecca Dulcibella Orpen, adorned the sanctuary with paintings and executed the Stations of the Cross in the body of the church. Members of the family were buried by the side of the church. In 1963 a side-chapel was added to enable the Sisters to see Mass being celebrated (hitherto they had attended in their choir and only heard Mass being offered) and the sanctuary was altered in 1970. The cemetery is still in use. In January 2011, because of a decline in the number of professed Sisters, the Poor Clares made the decision to leave Baddesley Clinton. The four remaining Sisters transferred their allegiance to the Poor Clares Community of Much Birch, Hereford. The Mass chapel was demolished and the church returned to its pre-1963 state. The former Sisters’ Choir was given to the parish for its use, while the conventual buildings were sold and converted into a series of domestic dwellings.